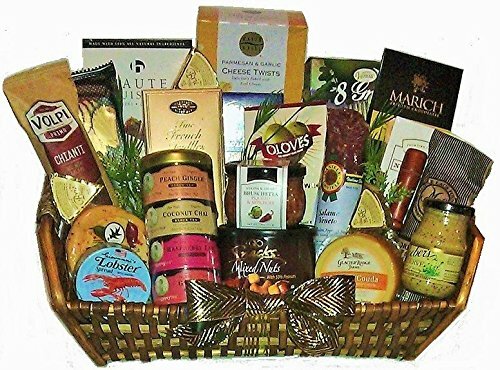 This gourmet basket says it all with an abundance of gourmet foods, snacks and sweets. Featuring Deluxe Mixed Nuts with Sun Dried Fruit, Smoked Salmon Spread, Aged Cheddar Cheese, Cranberry Cheddar Cheese, Italian Salami, Beef Summer Sausage with Cranberries, Fontina Cheese Spread, Cheese Spreader, Flatbreads, Crackers and Biscuits, Belgian Cookies, Cocoa Truffles, Dusted Chocolate Truffles, Pesto Bruschetta Dip, Honey Mustard Pretzels, Fruit and Nut Nougat, Sea Salt Caramels, Coffee and Teas, Chocolate Covered Cashews, Cherry and Pistachio and more. Presented in an extra large metal planter basket, wrapped with clear cellophane and satin occasion ribbon. Appropriate for Sympathy Expressions, Business Gifts, Housewarming, Holiday or group gatherings.